Can you find the Lost Hobo King? 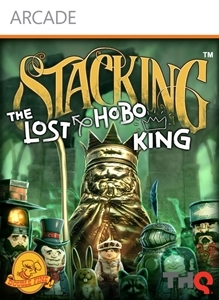 "In the Lost Hobo King, the first downloadable expansion for Double Fine’s Stacking, players once again assume the role of Charlie Blackmore, the world’s smallest Russian stacking doll. Charlie travels with his hobo friend Levi to the mysterious kingdom of Camelfoot, the mythical resting place of lost hobo king and his crown. Charlie must help Levi’s uncle, Rufus Ryken, reclaim his rightful throne by solving three tests of valor and reawakening the hobo blacksmiths of old. Only then can the crown be reforged, enabling Rufus to become king and unite the fractured hobo people under one sardine. The Lost Hobo King features a complete adventure with several new challenges, each with multiple solutions, an all new assortment of unique dolls with engaging abilities, and a new round of hi-jinks to discover and make trouble with. Only the worthy can reclaim the crown of Camelfoot!"